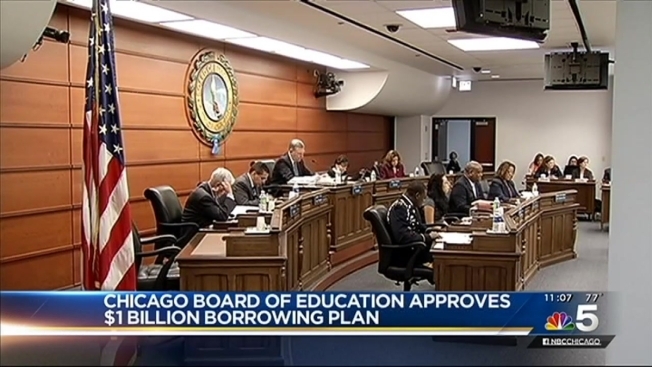 The Chicago Board of Education on Wednesday voted in favor of plans to borrow more than $1 billion to help the cash-strapped school district immediately and in the coming budget year. The borrowing approved Wednesday is on top of an existing line of credit of up to $500 million. Of the new loan, $200 million would be short-term, to help cover immediate bills, while the remaining $935 million would help the district in the coming year. The unanimous vote came a day after the Illinois House rejected a measure to delay an over $600 million pension payment until Aug. 10 when more funds become available. Gov. Bruce Rauner blamed House Speaker Michael Madigan for the bill's failure. Lawmakers are likely to take another vote next week. Chicago Public Schools is scheduled to make a payment of $634 million to the Chicago Teachers Pension Fund on June 30, but Mayor Rahm Emanuel made it clear earlier this week that the district did not have enough money to make the payment. Board president David Vitale said before the meeting that the consequences of not getting an extension on the June 30 deadline could be drastic, including layoffs. Vitale said he expects state lawmakers to act and he hopes the district can then come up with a longer term solution.